The League of Longfellow Artists (LoLA) began in the summer of 2009 as a small grassroots effort to raise the visibility of artists living or working in the Greater Longfellow Neighborhood of South Minneapolis. Artists Bob Schmitt, Anita White, and Shirley Neilson got together in the Longfellow community and said, “Let’s put on an art crawl!” LoLa has grown each year since 2009, when the crawl featured 42 artists at 20 sites. Nearly 10 years later, LoLa now flourishes as an annual art crawl that features more than a hundred neighborhood artists working in many different media. 2009 LoLa Meeting. Illustration by Anita White. In 2017 we became a 501(c)(3) nonprofit. We look forward to the expanded opportunities this status will bring our organization and appreciate your support along the journey. 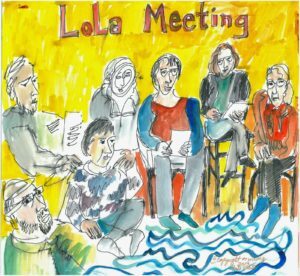 LoLa is a volunteer-driven community organization that showcases, nurtures and supports Longfellow arts and artists. We strive to represent the diversity of the Longfellow neighborhood through the arts. • invite and encourage community participation in the arts.